Unless you’re presenting a cure for insomnia, you want your PowerPoint slides to engage your audience without distracting them from the presenter (you). Too much text invites people to read rather than listen—if they don’t just tune out completely. 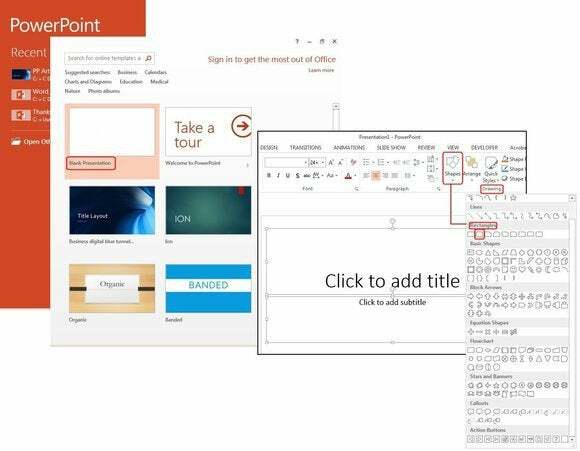 Fortunately, PowerPoint 2013 has some amazing new graphics features, as well as updates on older ones, that let you add customized eye candy to your slides. Here, we’ll show you how to create and format basic shapes and add some special effects. 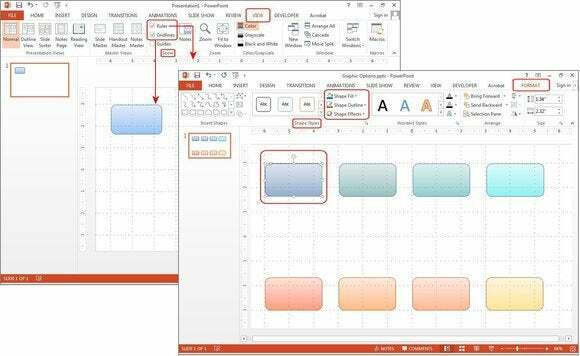 Start by opening PowerPoint and choosing the Blank Presentation slide. One slide with two text boxes appears. Hold down the Ctrl key and click the top, then bottom text box, and press Delete. Now you have a blank canvas/slide. 1. 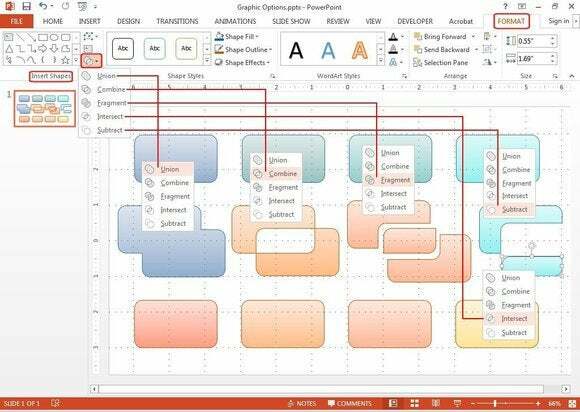 Just like in Word or Excel, you can select a custom shape, then modify it. From the Drawing group on the Home tab, select Shapes, then choose the second shape under Rectangles—the one with the rounded corners. Open a blank PowerPoint presentation, then create a shape. 2. The cursor becomes a cross. Hold down the left mouse button, then drag down and over to draw this rectangle. Release the left mouse button and the shape appears. Notice that the Format tab on the Ribbon menu is displayed only when the graphic is selected. 3. To format this shape, you can use the Drawing group on the Ribbon menu under the Home tab, the Shape Style group under the Format menu, or you can place your cursor on the shape, right-click, and select from the Shortcut menu. For simplicity, click the Fill icon on the Shortcut popup menu and choose a gradient from the Theme Colors > Gradient popup windows. 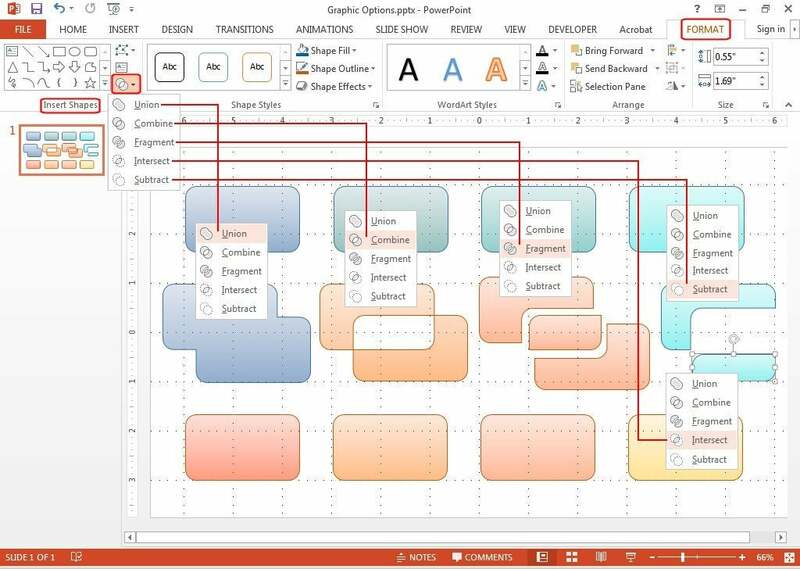 Format shapes, then add fill colors. 4. Now, to make positioning the graphics easier, select the View tab and check Rulers and Gridlines in the Show group. 5. Click your rectangle to select it, then press CTRL-C (to copy it) and CTRL-V (to paste it) seven times. Position the rectangles along the top and bottom of the slide (as shown). Notice that PowerPoint displays red guidelines to help you line up the rectangles both horizontally and vertically. 6. 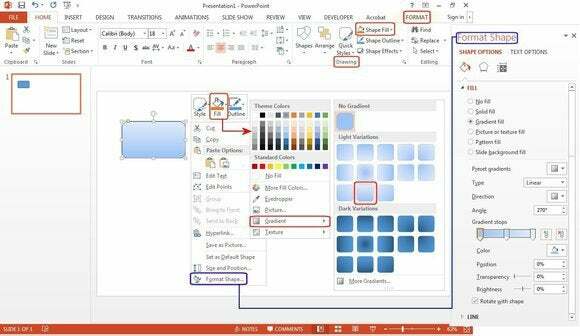 Select a color range for the top row and a different color range for the bottom row from the Shape Styles group under the Format tab, or right-click and make your color changes there. Change the line colors or just remove them, then convert all eight rectangles to gradients. Create and color eight rectangles with gradients. 1. 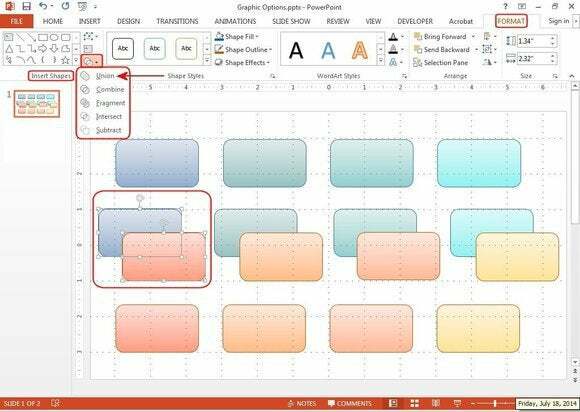 Copy each rectangle on the first row to the center, then copy each rectangle from the bottom row to the center and overlap the orange rectangles over the blue rectangles. 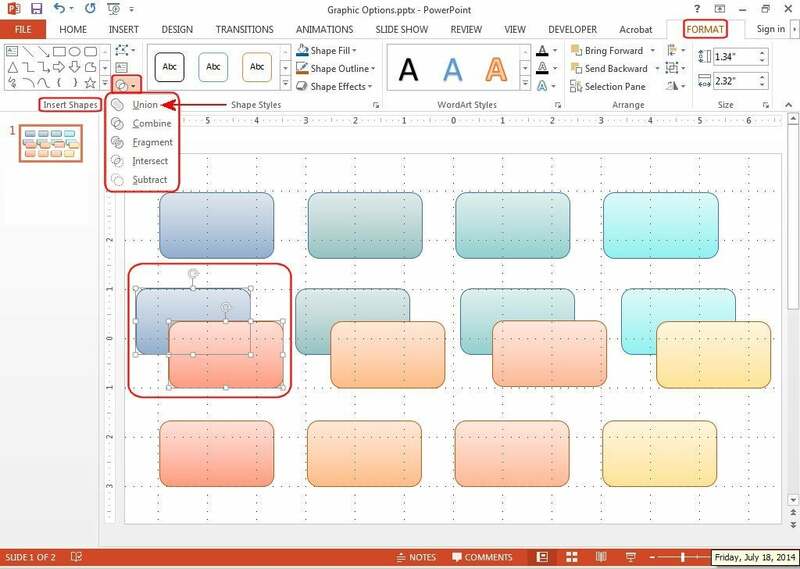 Select the first blue rectangle, then hold down the CTRL key and select the overlapping orange rectangle. Both rectangles are now selected and the Format tab is now available. 2. Click the Format tab, then select the Merge Shapes icon under the Insert Shapes group. From the Merge Shapes dropdown menu, select Union. The two highlighted shapes instantly become one shape. Duplicate the shapes before you merge them. 3. Select the next two rectangles. The first rectangle selected determines the color of the joined pair. Once selected, choose Combine from the Merge Shapes dropdown menu. This option combines the two shapes. Select the next two rectangles and choose Fragment. This option fragments all the overlapped sections into separate shapes. Select the next two rectangles and choose Intersect. This option removes everything except the intersecting area. Select the next two rectangles and choose Subtract. This option subtracts the entire second rectangle, including the intersecting area. Merge shapes to create custom graphics. 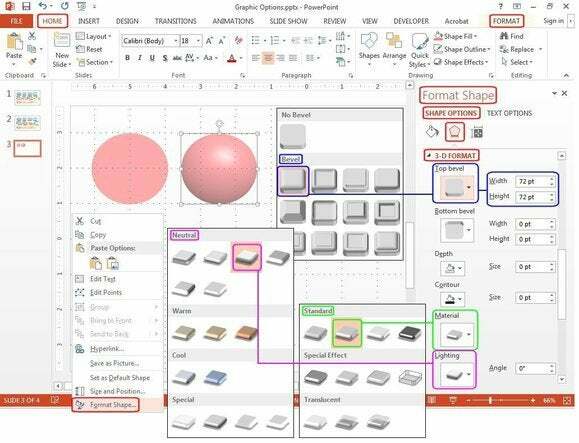 With these features, you can create any shape just by combining, joining, or dividing the basic shapes provided. Add the 3D features (below), and your shapes start to pop off the page. Add lighting, shadows, reflections, and materials to make them look more realistic. Combine, subtract, join (union), intersect, or fragment your shapes. 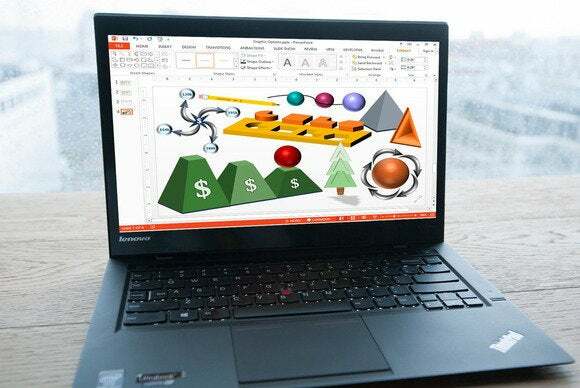 The special effects in PowerPoint 2013 are worth an hour of geeky experimentation to discover the many cool graphics you can create. For starters, we’ll select some simple shapes, convert them to 3D images, and then add bevels, colors, contours, depth, materials, and lighting. 1. 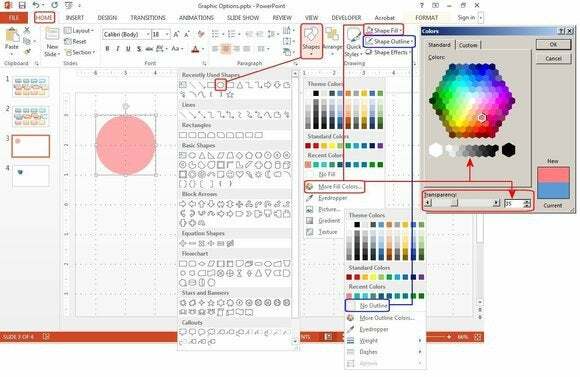 From the Home tab, choose Shapes from the Drawing group and select any shape. If your rulers and grids are still active, just position your cursor on the corner of one grid box. Press and hold the Shift key while simultaneously holding down the left mouse button, dragging the shape down and over until it covers four grid squares. 2. With the shape still active, select Shape Fill from the Drawing group under Home. Under Theme Colors, choose More Fill Colors, select a color from the color palette, then change the transparency to 35 percent. Select Shape Outline from the Drawing group under the Home tab (or right-click and choose the Outline icon from the Theme Colors popup menu and choose No Outline). Create a shape and then add color, a gradient, or a pattern. 3. For this step, we’ll convert the circle to a sphere. Right-click the circle and select Format Shape from the shortcut menu. The Format Shape menu appears on the right. Under Shape Options, select the center button Effects, then scroll down to the 3D section, and click the Top Bevel button. Choose Circle (the first icon under Bevel), then set the Height and Width to 72 pts (which is one inch, or the radius of the circle). 4. Next, we’ll add material and lighting. With the sphere still selected, choose the Material button from the 3D section of the Format Shape menu and then select the Warm Matte icon under the Standard panel. Next, select the Lighting button and choose the Soft icon under the Neutral panel. Now you have a sphere with soft lighting and a matte finish. Convert the shape to 3D, then add materials and lighting to make it look real. 5. Now, we’ll add some other cool effects: shadows, reflections, and glow. Insert a new slide. Copy the pink sphere from the previous slide to the new slide, then paste it three times. 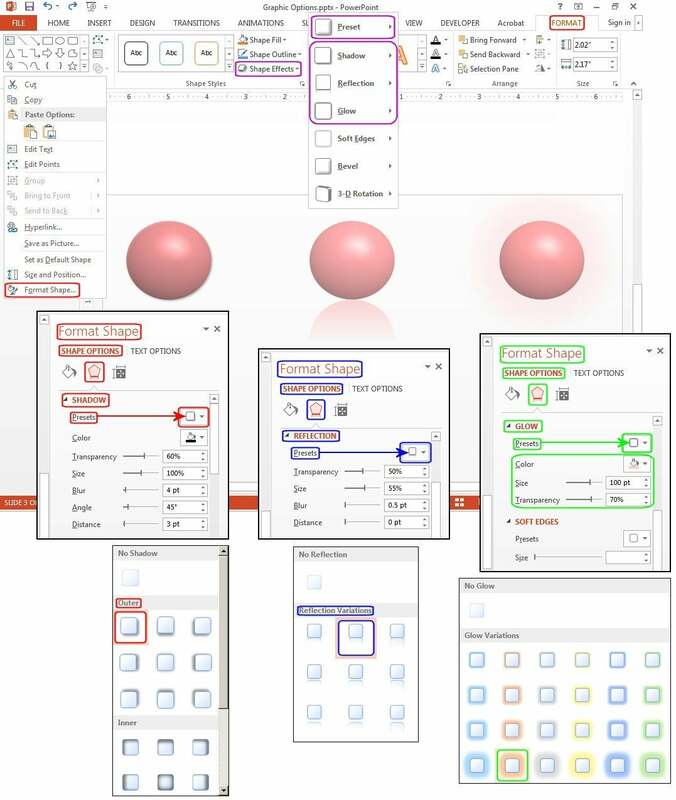 Right-click the first sphere, select the Format tab, then choose Shape Effects under the Shape Styles group (or right-click the sphere and select Format Shape from the Shortcut menu). 6. Under Shape Options, select the center button Effects, then scroll down to the Shadow section and click the Presets button. Here you can choose a preset shadow from one of the buttons displayed—in this case, select the Offset Diagonal Bottom Right icon under the Outer panel. Notice this option’s features are now displayed under the Presets button. You can play around with these settings or leave the shadow as-is. 7. Right-click the second sphere and select Format Shape from the shortcut menu to add a reflection. Under Shape Options, select the center button Effects, then scroll down to the Reflection section and click the Presets button. Choose a preset reflection from one of the buttons displayed—in this case, the Half Reflection, Touching icon under the Reflection Variations panel. Notice this option’s features are now displayed under the Presets button. These settings, too, are adjustable to your preference. 8. For a glowing sphere, right-click the third sphere and select Format Shape from the Shortcut menu. Under Shape Options, select the center button Effects, then scroll down to the Glow section and click the Presets button. Choose the second icon on the fourth row under the Glow Variations panel (Orange, 18 pt Glow, Accent Color 2). Add shadows, reflections, or glow to give the shapes character. That looked awful, so we changed it. In this option’s features under the Presets button, change the color to pale pink, change the size to 100 pt, and the transparency to 70 percent. Easy. This is just a sampling of the many ways you can create and customize shapes. 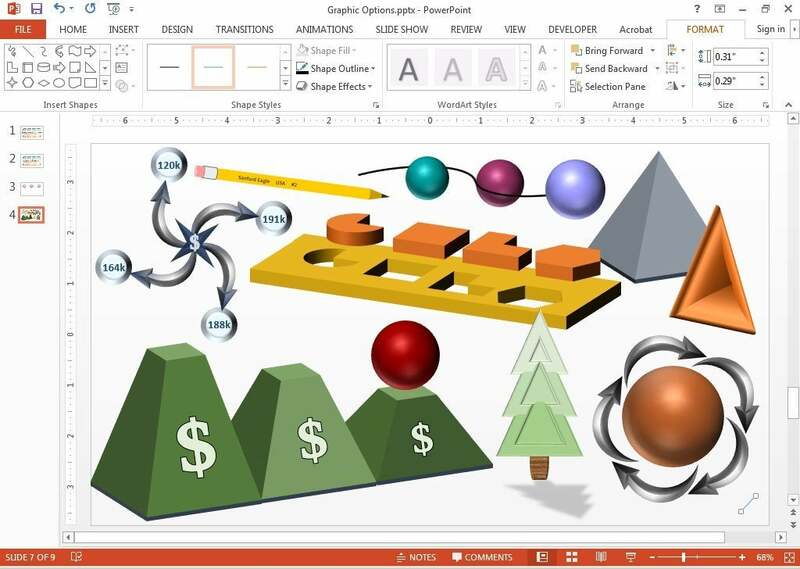 Stay tuned for more ways to spice up your slides in PowerPoint 2013.